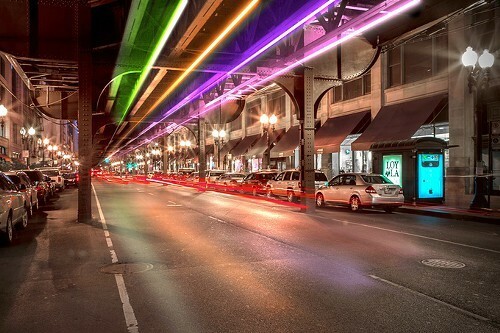 Two Chicagoans are working to introduce the city’s next piece of public art: a series of interactive LED light tubes running under the el tracks above Wabash Avenue. Seth Unger and Jack Newell, both 33, describe the Wabash Lights as "the first truly open-source piece of public art." The project involves more than 5,000 color-and-pattern-changing LEDs, all programmable via a website and app that anyone in the world will be able to access. Essentially, it's a four-block-long customizable light show, and with over 200 potential 'brushstrokes' to work with, Unger and Newell say the possibilities are endless. "You sound like a stoner when you talk about what these things can do," Newell says. "Because it's like, 'Hey man, have you ever wanted to play Pong on the el tracks?' But that's what we're going towards." In addition to the classic arcade game (which the guys insist is totally feasible) other possibilities include renting the lights out to corporations, coordinated marriage proposals, and casual "light jams" in which multiple users interact with the app or website simultaneously and watch the LEDs react in real time. Above all, the designers' hope is to create community and connection, particularly around Wabash. "We felt like it was an area of the city that needed to be imbued with a little more energy—activated in a way that turned it into something people were proud of," Unger says. "On the weekends it's kind of a bridge for people to get downtown or go to Millennium Park . . . everyone forgets about Wabash." "For a city that's incredibly segregated, it's one spot where you can actually see all the different people of Chicago," Newell adds. Unger, a designer-brand consultant, and Newell, a filmmaker, previously collaborated on films for Gensler, a design and consulting firm, and consider that experience especially formative. "Watching a film is being guided through an experience, and this is experience design," Unger says. “But it's on a scale that is more place making—to transform an area into a unique district." In order to complete the transformation, the two friends have launched a Kickstarter to raise $55,000 to fund a beta test of the Wabash Lights, constructing a small portion of the eventual four-block sculpture for troubleshooting purposes. The pair spent the past year obtaining all necessary clearances from the city, so all that remains is raising the money. "We're trying to do something you couldn't have done 15 years ago," Newell says. “It's important to us that the public responds, and if the people don't respond to it . . . then that's cool." "We'll cry ourselves to sleep, but it's cool," Unger adds. The duo ultimately believes that this passion project is something by Chicagoans, for Chicagoans. "We love Picasso, and Anish Kapoor is one of my favorite artists," Unger says. "But we're local. We're born and bred." "In the inclusivity [of the Wabash Lights], people can be like, 'Yes, we did this.'" Newell says. "It wasn't the government. It wasn't anyone else. It wasn't some rich, eccentric billionaire. It was like, 'No, we did this.'" Behold the least pretentious gallery show in the city this week.